Back in September we invited people to help us design a programme of support for our sector who are keen to lead innovation and transformation in their teams, organisations or communities. This was part of work that Dudley CVS staff and trustees have been undertaking around five priorities we set ourselves this year, which I blogged about in August. The group of us working on the priority around innovation, transformation and sustainability have recently fed back to Dudley CVS board, below are the highlights. These are from in depth conversations with leaders of eight different organisations in Dudley borough. What do innovation, transformation and sustainability mean for people in different contexts? The people we have spoke to frequently touched on ways in which the sector is becoming more like social enterprise, using tactics previously thought of as belonging to business. Publications such as the Compendium for the Civic Economy and The Convergence Continuum: towards a 4th sector in global development? highlight ways in which the boundaries between the private, public, and non-profit sectors have been blurring. 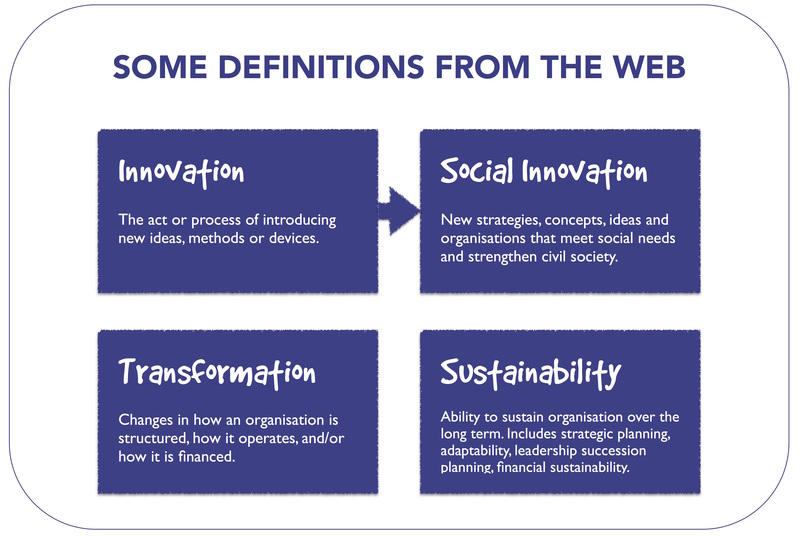 Pioneering organisations have emerged with new models for addressing societal challenges that blend attributes and strategies from all sectors. They are creating hybrid organisations that transcend the usual sectoral boundaries. The key question we explored with people we have spoken to was: how might we support voluntary organisations in Dudley borough to innovate, transform and become more sustainable? We were explicit that ‘we’ didn’t mean specifically Dudley CVS, it could mean anyone who wanted to be involved, including people supporting each other. Collaboration and less competition. Collaboration has been mentioned more frequently than anything else. Seeing or knowing about other things from elsewhere / other contexts to bring and innovate with. This has come up a number of times. Creativity – trying things out, making mistakes. This has also been mentioned a lot, sometimes in relation to a perception that the sector underestimates it’s knowledge and skills, it’s ability to be nimble and creative. People we spoke to wanted the sector to be more confident. Other points which stand out from the conversations include how we respond to and use digital technology to help innovation etc. Also suggestions about using assets (buildings, equipment, skills etc.) differently, and sharing assets with each other. One conversation delved into alternative forms of finance, such as social investment bonds. Another explored the importance of language and framing – the need to help overcome fear, resistance and closing in with an optimism around opportunities and a focus on what we do have (rather than what is being taken away).